Two sisters, 20-somethings, (first) asked us to help find an apartment in a clean, healthy, building. 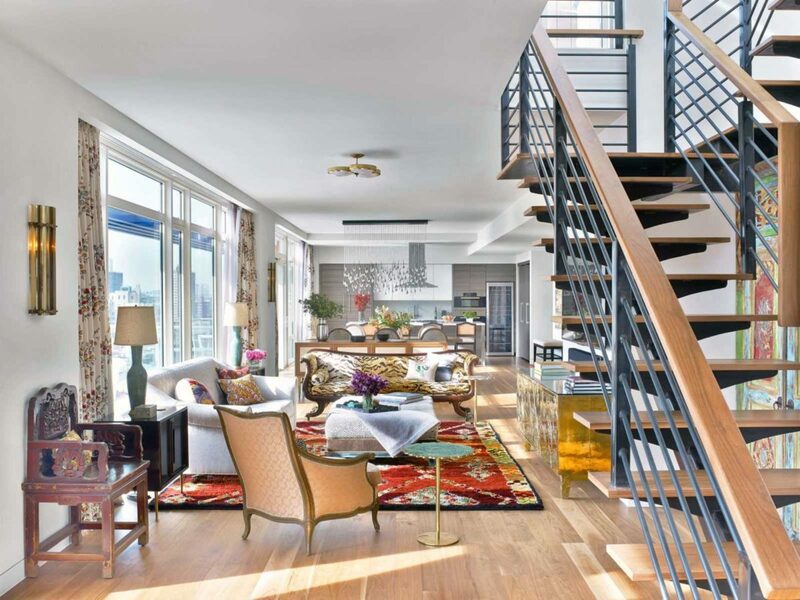 Their greater desire was to live in a home where their chemical sensitivities were relieved, and this Penthouse interior design in Chelsea, NY with its new construction and LEED certification, fit their needs. The mix of Morocco, India, and Bali, all unified by the colors. The other unifier? A distinctly Asian/Arabic theme; it’s a thread we weave in here, and one we use frequently in all our work. Over the dining room table we hung a raindrop crystal fixture, its 112 individual “ raindrops” add light + beauty + amazement for everyone who sees it. More amazement, and also just some pure joy, comes from three little gems of side tables. Gems, figuratively and literally; their surface tops are made of semi precious stones– mother of pearl, malachite, lapis—little pieces of jewelry spread around the room. One sister is a painter, and so, right in the middle of everything, we created a studio. Initially, we were going to close it in, but when they looked around, and saw how its openness added so much to the feel of the entire space, they decided they liked it open…and we did too. The bedroom wishes for the artist sister surprised us. She likes a lot of color and uses it in her art, too, but in here she wanted soft and neutral. We created that feeling with the gold leaf wallpaper, that’s mimicked in the Murano gold chandelier, and in the goldish green of the drapery. The bed, custom designed by KCD, added a soft texture with its cowhide insert that we also picked up in the cowhide rug. Without a lot of closets in the apartment, we designed a custom double armoire and again, seeking warmth, we placed iridescent leather into the wood frame. We imagined rest coming easily: lie down, look up, and rest eyes–at a ceiling covered in peachy pink velvet. In the second bedroom a whole story was unfolding. In this very glassy, very white box of an apartment, this sister wanted warmth. We loved the challenge and knew where to start: wall coverings. 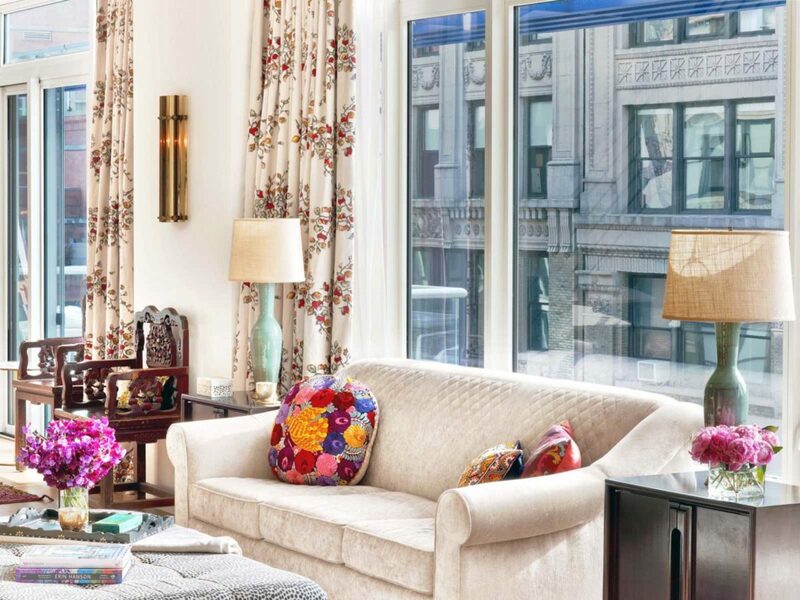 Her interest in Turkish tile led us to use a Christian LaCroix wallpaper in a beautiful rug pattern. Then, as with the other bedroom, additional storage was needed here, too, and so we designed the chest at the end of the bed, as well as the custom armoire, both with custom embroidery. And the bed? In such a big room we wanted the scale to be more, well, intimate, and we also happen to love a great canopy bed. But here we wanted to take it and give it a fun and fresh twist. More warmth and more style meant more pattern. We balanced that with warm solids: the white bedding, the white background on the armoire’s upholstery, the white ceiling, and then a neutral camel on the chaise—but the rich red holds it all together. What does good health open the door to? Joy, love, inspiration, laughter. All of which we hope for here in this home.